In April, my husband and I spent a week in Oregon. Our trip began along the Coast with a road trip from Cannon Beach to Florence. You can read about it here. For the rest of our trip, we stayed in Portland but only used two days to explore the city. On the other two days we explored the Columbia River Gorge and Mt. Hood. Here’s everything we saw in the city during our two day stay in Portland. Spend a Long Weekend in Portland and visit all of these places! The Hoyt Arboretum is a great place to visit if you have children and love the outdoors. If you’re looking for a day of hiking or cycling, this area is perfect. Located within the Washington Park, trails connect the Arboretum to the Pittock Mansion (see below), the Japanese Garden (see below), and the Zoo. Getting there: One option is to drive and park at the visitor’s center or one of the many other parking lots. Another option is to take public transportation. Since we live in South Texas, we enjoy being in forests and being surrounding by tall trees. The fact that this beautiful natural area was inside a major city was amazing to us. We didn’t plan a day of hiking the trails, though. Instead the Arboretum was a minor detour on our way to the Japanese Garden. Tip: If you plan on visiting the Aboretum, add the Japanese and International Rose Gardens to your itinerary. These three outdoor spaces are within walking distance from each other, making it easy to see them all in one morning. See below for which trail to take! To reach the Japanese Garden from the Aboretum, follow the Oak Trail and Wildwood Trail or look for the Visitor’s Center and grab a map, just in case. (The gardens and arboretum are separate parks, which will be stressed upon you at the visitor’s center.) The trail is marked so you’ll be able to figure out which direction to go in. Also, the trail will take you to the backside of the Japanese Garden, requiring you to walk all the way around to the front entrance. I love visiting botanical gardens. Each city has something that makes their gardens unique, and Portland’s Japanese Garden is no exception. I live in San Antonio, Texas, which has a Japanese Tea Garden (free to the public) and its a beautiful hidden gem. But it does not compare to this garden with its waterfalls, bridges, multiple sections, and views of the city. If you love walking through gardens or taking pictures of flowers and Japanese architecture, the Portland Japanese Garden is a must see! When you first enter through the gates you follow a path uphill. You’ll enter the Cultural Village first, a wide open space with a Tea Room, Gift Shop, and the Tateuchi Courtyard where demonstrations and performances are occasionally held. Head through a gate to reach the different garden sections. Follow the path towards the Strolling Pond Garden to see the beautiful waterfall and bridge over the pond. Down a path between the Strolling Pond Garden and the Flat Garden is the Natural Garden. This is a small area where the paths are narrow. Small benches are placed throughout so visitors can enjoy the tranquility of the small ponds and water features. In the opposite direction of the Strolling Pond Garden is the Flat Garden (a giant zen garden) and the Pavillion. Behind the Pavillion is where you can see Mt. Hood on a clear day. We chose to visit the arboretum first then walk to the Japanese Garden because we were visiting on a Monday and the Japanese Garden didn’t open until noon. (Tip: noon is not the best time to photograph flowers). Luckily, we timed it well enough to arrive shortly after it opened. There was no line when we purchased tickets, but there was one as we were leaving. Also, another reason to show up when it first opens is that there are several narrow walkways winding through different sections of the garden. These can become crowded very quickly. Although there is parking available outside the Garden, it is limited and public transportation is recommended. There is a free shuttle for the Washington Park which offers rides to the Japanese Garden. To find out more about this option, click here. We visited during April so the shuttle was only available on Saturday and Sundays. Its a more viable option during the summer months. Note: If you’re visiting with small children, some areas of the garden do not allow strollers. The Portland Rose Society began in the late 1800’s with an invitation from Georgina Pittock (want to know about her, read on!). By 1905, Portland was known at the “City of Roses”. As World War I broke out across Europe, a Portland journalist had the idea of a save haven for rare European roses. The International Test Rose Garden was dedicated in 1924. There are several sections of the garden. Some areas are divided by type of rose: landscape, perennials, climbers, etc. Then there are themed gardens: Shakespeare, Gold Medal, Royal Rosarian. Bring water, a hat or parasol, don your sunglasses, and take a stroll and smell the roses! If you’re visiting before May, you may want to skip the Rose Garden. We visited at the end of April and no roses were in bloom. Peak time is in June. The only reason we walked through was because we had no other transportation option and the garden was a much prettier option than the streets. The garden seemed to be a popular place for locals to relax, however. So if you have a picnic blanket, spread out on the lawn or the amphitheater seats and enjoy the sunshine, if you’re lucky to have some. If you’re like me, learning about the city you’re visiting is always on the list of things to do when traveling. Usually this means visiting a museum or taking a guided tour. In Portland, however, we toured a mansion. We saved the mansion for our last day in the city. Since it doesn’t open until 10 am, it meant we were able to sleep in after several jam packed days. The history behind the Pittock family home gives visitors a glimpse not into the family’s life but into Portland’s history. Henry Pittock and his wife, Georgiana, built the Pittock Mansion in 1914 after Henry made his fortune as the publisher of The Oregonian newspaper. They influenced the shape of the city, not only through this publication, but through Georgiana’s charitable efforts. Unfortunately, the couple only lived in the home for four years before they died. The surviving children remained in the home until the 1950’s. But upkeep of the home without the income from the newspaper was difficult for the daughters and the home was put up for sale. Over the next years the abandoned home fell into ruin. On Columbus Day in 1962, a storm with hurricane-force winds slammed into Portland, causing major damage to the home. The fate of the mansion was uncertain. It was most likely going to have to be torn down. Luckily, locals stepped forward and started a campaign to save the building. In 1965, the home was opened to the public as a museum. Most of the items were donated by citizens and collectors, with only a few pieces belonging to the Pittock family. The basement is dedicated to the history of Portland, with a special focus on the storms that have ravaged the city. When you’re done walking through the three floors of the mansion, another building you can tour is the groundskeeper’s house, known as the Gate Lodge. If history isn’t your thing, maybe the view from the grounds is! At the edge of the lawn is a magnificent view of the city and, on a clear day, of Mt. Hood. Tip: We chose to drive to the Pittock Mansion because (1) we had a rental car and (2) it was faster than taking a taxi/ride share. There is a large parking lot, so if you arrive when the mansion first opens, parking should not be an issue. I didn’t find a suitable public transportation option, so keep that in mind if you’re planning on seeing this historical building on your trip. Need a break from walking around the city? Pioneer Square is a great spot to sit and plan the rest of your day. Its also a major hub for the MAX Light Rail. Grab a bite to eat or a drink from one of the food trucks and enjoy some people watching. Or walk around looking for all of the artwork. I’ll be honest. There isn’t much to this square. We spent maybe 10 minutes here as I roamed around looking for the different public artworks to photograph. What I did find interesting about this square, however, is the history behind it! There is an iron gateway across from the courthouse and a photograph of what used to occupy the space: a hotel. From 1890 to 1951, this square was occupied by the Portland Hotel. The six-story grand hotel was a landmark and visited by 11 U.S. Presidents during its prominent years. By the 1940’s, the renovation costs were deemed too high during an era of modernization. The building was torn down and replaced by a parking lot. Luckily, by 1984 after years of discussion the parking lot was turned into a public space. You can see a picture of the hotel next to the iron gate. If you do not have time to visit this waterfall park, you can skip it and not feel bad about it. I mainly wanted to see it because I recently purchased a neutral density filter and wanted to take photos of all the waterfalls! The park is not close to any other main attractions, but if you’re going to be on the waterfront, then take a detour to the Keller Fountain. We walked about 15 minutes from Pioneer Courthouse Square to the Fountain Park since we had time to kill before happy hour. Visit a bookstore on vacation? Yes! In a time when bookstores are closing their doors, this massive store is a marvel to behold! It occupies a city block and has rows upon rows and rooms above rooms of books! It’s every book lover’s dream. Just try not to get lost! My husband made it out with only 3 books and I left with my only souvenir from the trip: a coffee mug (I have a problem). Tip: save the bookstore for the evening because its open later than most places in Portland! There is a lot to see along the Columbia River Gorge, even after the 2017 wildfires. If you plan on staying on the Oregon side of the river, some of the hiking trails and stretches of the Historic Columbia River Highway are closed. You can drive further down the highway towards the Dalles, or stay closer to Portland, depending on how much time you plan on spending in the area. For a more detailed look into planning a trip along the Columbia River Gorge, check out my post here. 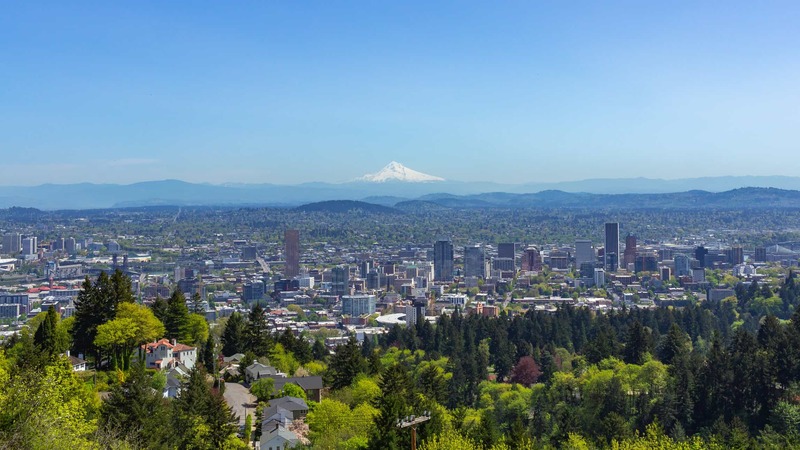 Depending on the time of year you visit Portland, you can either ski or hike Mount Hood! Winter lasts a long time on Mount Hood so check the weather conditions and open areas when you plan your trip. In April, when we visited, most of the park was still being used for winter sports, mostly snowshoeing. This meant we had very few options as far as trails went since we did not come prepared for snow activities. I had waterproof boots but my husband had tennis shoes. Luckily, we stopped by the Information Center in Government Camp and got some suggestions. I recommend this even if you know exactly what you’re going to be doing because you may learn about sections that are closed. For instance, one hike I really wanted to do was Mirror Lake Trail. We thought the trail was open because cars were parking by the trailhead. Turned out that parking was not allowed during that time and if caught you could be fined several hundred dollars. Good thing we missed it and kept driving! For a more detailed look into the trail we hiked on Mount Hood, check out my post here! For more Portland Tips, check out my post here and discover places to eat, drink, sleep, and more. What are some of your favorite spots in Portland that you would recommend seeing during a short stay? Share in the comments!